"This recipe may be simple but its flavor is big and juicy. I think it would be fabulous alongside spicy Asian curries, quick stir-fries, herb-roasted dinners -- and yes, it would be perfect for picnics. This is a delicious make-ahead picnic salad. Make more than you think you'll need, because you just might want some for breakfast." 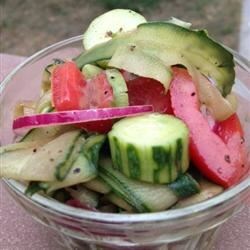 Place the cucumber chunks and slices in a large bowl with the tomato and onion. Whisk together the champagne vinegar, balsamic vinegar, olive oil, agave nectar, salt, and pepper in a small bowl until frothy. Pour dressing over the vegetables. Gently toss to coat. Cover and refrigerate for at least 1 hour before serving. A nice refreshing summer salad. The longer this recipe can marinade, the better it gets. The flavors of this salad come together really well. Thanks Pinkmonkey19 for sharing. Wonderful salad. I do a little less sweetener and more tomatoes. Sometimes also switch and do red onions. Love it. Thanks!